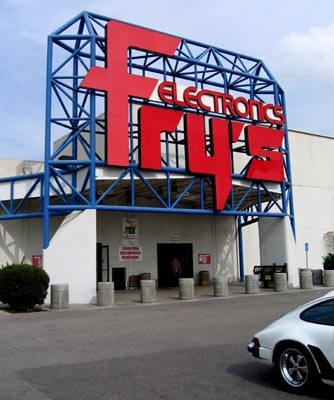 What would a trip to Los Angeles be without a trip to Fry’s Electronics, this is their Anaheim store. Talk about a geek-fest. They have all kinds of gizmos and gadgets in here along with refrigerators, stoves and other major appliances. 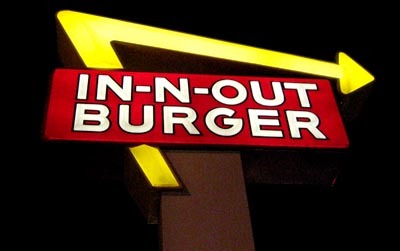 Finally made it to IN-N-OUT BURGER. I’ve never been to one so I decided it was about time, a bunch of the photogs at the SportsShooter.com workshop were making meccas to the burger joint but I had a hell of a time getting to one. I saw plenty as I drove around town or on the freeway when I wasn’t hungry or couldn’t get off the freeway. When I tired looking for one for lunch I couldn’t find any, the guy in one store was hopeless as he gave me instructions that turned out to be bogus. When I was in Hollywood I finally found an INOB, drove up to it and there was a car stalled right in front of the entrance. What are the chances? So I had to drive past and got onto the freeway back to Laguna Beach. I knew there was one near Huntington Beach on PCH so I headed for that (even had it waypointed in the GPS when I had passed it a few days before). And I finally got there to try these special burgers. So I get in there and find this menu board. I expected something like a Baskin-n-Robbins of hamburgers the way people talked about this place. It was more like an ice cream shop with two flavors, vanilla and chocolate (hamburger and cheeseburger in this case). 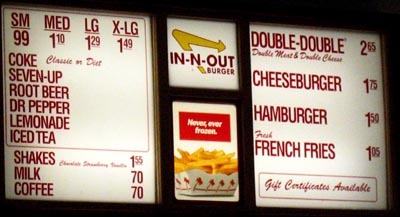 But what they’re known for is speed and quality so I ordered a combo: cheeseburger, fries and coke. Hey look Ron, fries don’t come with the burger here, you gotta order it separate on in a combo. Here it is, the cheeseburger combo. I’m sure this same meal has fed movie stars, NFL football players, professional surfers, whiz-kids of dot-com companies and Fortune 500 CEOs. 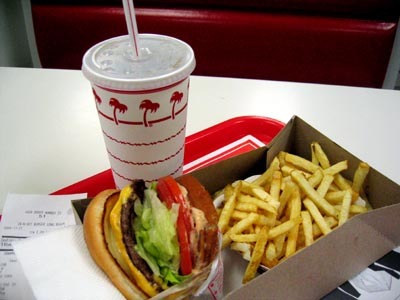 I can just see Jesus now handing out cheeseburgers, fries and cokes from an endless basket if he were alive today. It was a pretty darn good burger. Pretty close to the Harbor House burgers in Kona ranking I’d say. The ingredients did taste fresh and they have an army of kids behind the counter pushing spuds through a cutter before tossing them into the deep fryer, flipping burgers and swiftly dealing with drive-through customers. I wish they had workers and service like this in Kona everywhere.